Have you ever faced a problem of formatting you hard drive? If yes, you understand that this is an unpleasant moment when all your data accidently disappears. But do not worry; there are some helpful ways to recover formatted hard drive. Here are some tips on how to save your data and recover it as well. Nowadays, most of us rely on various gadgets and do not know what to do if some faults happen. The only thing we all know is that all our information is collected and stored on the hard drives. Some people understand the significance of data and make backup copies, while the others even do not know about them at all. That is why due to some accidents, the data may disappear and you will be quite upset. However, remember that there is always the way out. It does not matter what is the reason for data loss, you can easily recover formatted hard drive by applying special recovery software. One of the main reasons is connected with detecting. That is to say that sometimes hard disk is not seen by the system. That is why the system may stop working in the middle of the process, making for you an obstacle to access to your data. Another reason may be related with a crashing of the hard disk. In this case, you may hear the weird noise inside the disk. Some people believe that data may be lost when there is an inappropriate power supply. Additionally, a sudden shutdown of your device may also be a cause of data loss. Analyzing the mentioned above information, one may admit that all of the problems sometimes happen because of our inattentive behavior. We usually forget to switch off the device rightly or reboot it. When you lost data do not panic and try to find solutions to solve this issue. It is also important to take some important measures before recovery. It would help you recover your data in a higher rate. A You should stop working on the computer when your hard drive formatted. It will be better to close all the programs. B You should try to analyze what may be the reason for such a fault. C Do not make a panic since you may recover files from the formatted hard drive with the blasting speed. All the data is still located on the hard drive, so the only thing that you have to do is to get the formatted disk recovery program to retrieve data from the formatted hard drive. Today, there are a lot of different programs for recovering of the formatted hard drive. You may search the internet and find out the most appropriate one. Let us analyze recovery software on the example of AnyRecover. This is effective recovery software which can assist you to recover data from the formatted hard drive. This software does it easily and quite quickly. Moreover, it is copulative with all the versions of Windows. Together with the user-friendly interface, the software does not require a specialist to install it. You can do it yourself without any help. Recover all types of data, music, audio, photos from the formatted hard drive completely and effectively. Supply data recover from various gadgets, such as digital camera, memory card, flash drive, hard drive or recycle bin. Recovers files 100% safely from different data loss cases on various devices without overwriting original data. It has three scan levels to ensure getting data back with easy operation. 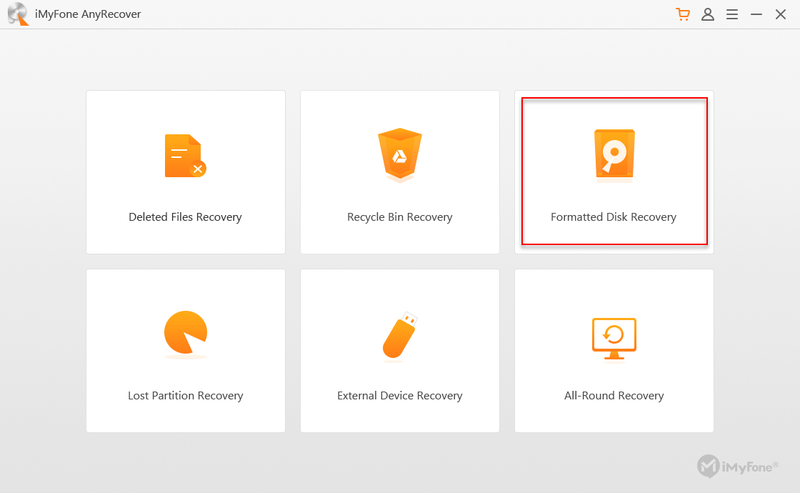 Step 1: The first step will be to launch AnyRecover software and choose “Formatted Disk Recovery” recovery mode. Step 2: The second step is to select a certain location where the data may be lost. Step 3: Choose the file type you want to retrieve and click the “Scan” button. Step 4: It will begin an elementary scan, and show you all the lost files in the list. Step 5: You can choose to preview them and click “Recover” to get back your data. There is only one correct way to format the hard drive. All you need to do to make sure the formatting is right and that you will not lose all the data, always use the backup tool to backup all your data on external hard drive formatting the hard drive. Thus, all the data will remain safe and you don’t have to go through the trouble of restoring it after that. All in all, when you accidentally losу data do not panic and try to find a relevant solution to this issue. Remember, that such a situation may happen to everyone, so there is a way out. You should get the recovery software which will recover all data loss. The bright example is AnyRecover. It is quite easy to apply and you can do everything on your own. Do not worry, and find the alternative way to help your data. How to Delete and Create a New OST File?